Off the back of BioShock Infinite celebrating its fifth anniversary and Third Editions completing their second successful Kickstarter – of which I backed their Final Fantasy VIII book – we can take a look at another of their offerings, this one focusing on the BioShock trilogy. First and foremost, this book is intended to be an extension to the series, acting as an essay written to pick apart the trio of games and delve into their beginnings and inspirations. This book, and their others, have been available in French for a few years but we are now benefitting from them as well as they are translated into English. It takes apart the three games and dives into their history, plot and inspirations. It’s a long read and is designed to be left on the bookshelf once complete, rather than traditional artbooks which are more commonly left out for a quick look through every now and again. 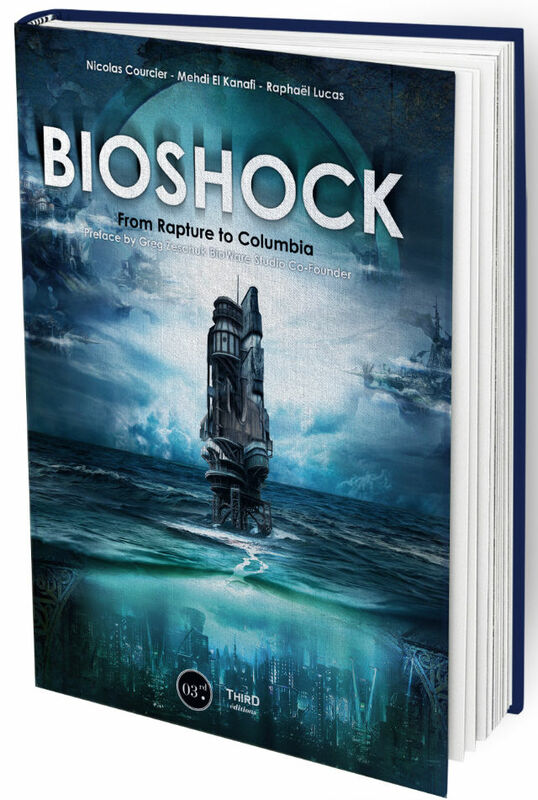 The book is split into three main parts: Part One contains everything to do with BioShock 1 and 2, Part Two contains Infinite and Part Three discusses the spinoffs, music and legacy. Obviously, there is some blending going on between Part One and Two simply due to the overall story being told, but the basic structure is to keep them separate as much as possible. Parts One and Two both start with an incredibly detailed retelling of the main plots of the games. An excellent introduction to the chapters that follow consider plot points from the main game, but also the audio recordings and voxophones dotted around the game worlds. The original BioShock story even takes details from John Shirley’s prequel book that ties-in to the games. These – almost novella style chapters – are the perfect way to introduce the games. The next chapters look at the worlds themselves – Rapture and Columbia – and where they got their influences and inspirations from. Going into detail about objectivism for the first two Rapture games, the book throws some hefty theorems and opinions at you, but all are backed up and explained thoroughly. Each influence is explained with a brief description to tie in why it is an influence and what has been garnered from it. But these influences can also be used as an extension for later reading/viewing/playing as they have been added in such a way that makes it easier to track them down should you so choose. If nothing else, the book is worth reading alone for all these. Part Three of the book explores themes and media outside of the game trilogy, concentrating on the planned and cancelled spinoffs, the music of the series and the legacy it leaves. The spinoff section includes details on the planned, but cancelled, Playstation Vita tactical RPG game, as well as the story behind the doomed movie outing for the series. It isn’t all bad news for this chapter as it also has details on the prequel book mentioned earlier, even mentioning the Infinite board game The Siege of Columbia, which focused on the civil war that was a secondary plot in the game. Having played this board game a few times, it certainly fits in with the franchise and rightly deserves a mention. Throughout the book there are numerous quotes from Ken Levine, but for me, there aren’t enough of them. It would have been nice to see an interview with someone who worked on the games, not even necessarily Levine himself. Without this, the book sometimes comes across as pure speculation of what the teams’ thoughts and influences are. I have no doubt that the writers of the book have got it spot on, but there isn’t any real proof to back it up. This is a book that is heavy on detail and theories once you get past the initial opening chapters. As mentioned before it reads as an essay and a deep dive into the BioShock universe. It isn’t intended to be a coffee table-style book with art pages or anything like that, and that might put a lot of people off. What the book is though, is a perfect accompaniment for anyone looking to relive the trilogy they may not have access to anymore, or the next step for previous players looking to expand their knowledge and discover just how the worlds came to be. As a fan of the franchise, this is a very interesting and eye-opening read at just how much thought went into these games.